Italy has threatened to stop vessels of other countries from bringing migrants to its ports. The warning came as Italy's EU representative, Maurizio Massari, warned in a letter to the bloc the situation had become "unsustainable". Prime Minister Paolo Gentiloni has accused other European nations of "looking the other way". An estimated 10,000 people are believed to have attempted the journey from North Africa in the past four days. More than 73,000 migrants have landed in Italy this year, an increase of 14% on the same period last year. 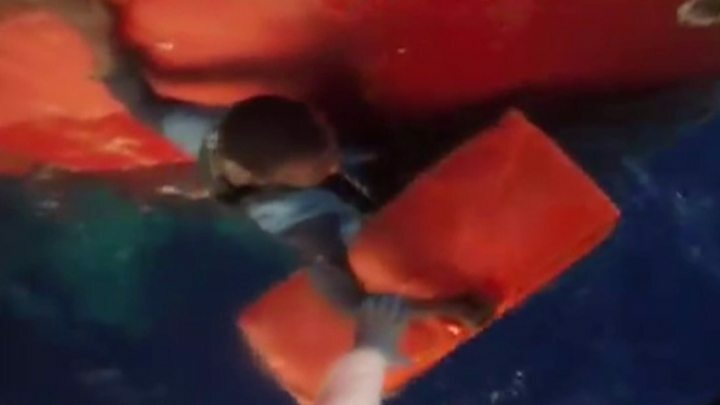 Some 2,000 have died or are missing feared drowned, the UN's refugee agency says, the vast majority attempting the crossing from Libya. Libya is a gateway to Europe for migrants from across sub-Saharan Africa and also from the Arabian peninsula, Egypt, Syria and Bangladesh. Many are fleeing war, poverty or persecution. Why is Italy reacting now? The Italian coastguard takes the lead in co-ordinating rescue operations but many of the vessels run by non-profit groups sail under the flags of other nations including EU countries like Germany and Malta. Former Prime Minister Matteo Renzi said the Italian public were "exasperated" with the issue and a new long-term strategy was needed. Would blocking rescue ships be legal? Rules on disembarking are governed by international law and the EU office on migration said any changes to guidelines should give humanitarian groups time to prepare. The International Convention for the Safety of Life at Sea dictates that any ship learning of distress at sea must assist regardless of circumstances, and that the country responsible for operations in that area has primary responsibility for taking them from the ship. It also clearly states that the relevant government "shall arrange for such disembarkation to be effected as soon as reasonably practicable." For boats departing from western Libya, Italy is likely to be the closest port. The European Commissioner for Immigration, Dimitri Avramopoulos, met Italy's Mr Massari to discuss the crisis. "Italy is right that the situation is untenable," he said, adding that the country's management of the crisis was "exemplary". It was time for EU member states to "step up", he said, and contribute financial support to Italy if needed, along with aid to African nations like Libya to reduce the numbers of people leaving - a promise made in February. "Now is the moment to deliver, and we will hold them to this," the commissioner said. "In everything we do, we all have a humanitarian obligation to save lives... we cannot leave a handful of EU countries on their own to deal with this." Medical charity Medicins Sans Frontieres said it had been calling for more support from the EU for some time, urging that "all the states should take part", Ansa news agency reported. Has Italy raised concerns before? Yes. In April, an Italian prosecutor claimed humanitarian charities were "colluding" with people smugglers in Libya, alleging that phone calls were made between the two parties. Italy has seen more than 500,000 migrants arrive by boat since 2014. The closure of a land route north through the Balkans has added to the pressure. Libya has been in chaos since long-serving ruler Muammar Gaddafi was ousted in October 2011. On Wednesday, seven UN staff who had been visiting a migrant detention centre in the western town of Surman were seized by gunmen as their convoy headed towards the capital, Tripoli. They were later released unharmed to local security forces.